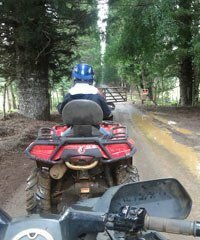 Maui off road adventures and Maui ATV tours have become all the rage in the last decade or more. And why not? Maui ATV tours are exciting and they are fun. These off road excursions allow you to travel into areas that would be difficult for you to reach in any conventional way. Also, the areas these ATV rides take you are generally on land that would have no access available to the general public. In most cases we offer these tours at discount prices. 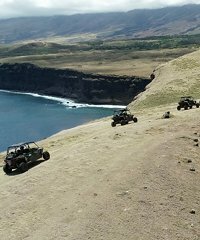 What are Maui ATV Tours? An ATV (all terrain vehicle) is any motorized off-road vehicle designed to travel on four low-pressure tires and having a seat straddled by the operator and handlebars for steering control. What is a Dune Buggy or UTV? A dune buggy is a recreational vehicle designed with large wheels and wide tires and is used primarily for traversing difficult and irregular terrain. Dune Buggies normally are rear wheel drive with larger tires in the rear that may have paddles on them. Dune Buggies with paddle tires are also sometimes called "Sandrails". UTV's are similar to Dune Buggies except for the fact that their wheels are all the same size and they often come with four wheel drive. UTV's are commonly called "Side by Sides". Dune Buggies and UTV's are ideal for couples or families who have children that are too young to drive their own vehicle. 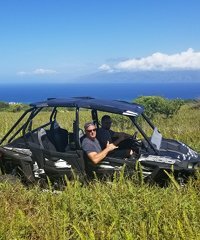 Maui ATV Tours do not pick up at the cruise ship but may be reached via rental car on the Sunday afternoon or the Monday morning of your Maui visit. We can arrange for you to be picked up at the ship by your Rental Car on the day of your choice. 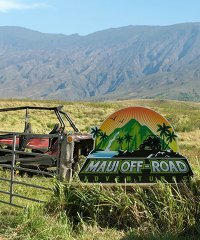 View the RESTRICTIONS area after you click on each of the Maui off road adventures listed below for specifics regarding the cruise ship itinerary. 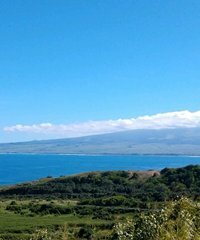 Can availability for a Maui ATV ride be a problem? This next video segment is going to be ATV rides on Maui. We've had ATVs here probably for 20 years. At various times we've had a couple two or maybe three or one ATV company. Currently, we have one but that can always change, who knows? This video will probably be around for awhile. ATV rides are a lot of fun just in general for a couple of reasons. The vehicles themselves are a blast to ride. This is an example of one. You can ride them by yourself, you can ride them together as you're seeing here, but they're designed to take you out into places that you could never really get on your own. They are quite remarkable of being able to do that. You've got this terrain that you're going over, which is often very hilly and rocky but it can be traversed very easily with these. The second thing about these is that you can go right to the water in the streams and get into places that are really fun to traverse. The one thing that you need to realize of course is that you're going to get filthy on these. You could get a closeup on those people right there, you can see that this is a filthy trip. If it's not raining, it's going to be dusty, and if it is raining or there's any water around, you're going to get muddy. That's part of the fun, I think. If you don't enjoy getting dirty, this is probably not the trip for you. If you don't mind a little mud or kind of like gravel in it, this is the trip for you. You're in hog heaven so to speak running on these. They're fun, that's one thing about the ATV but secondly, the other neat thing about them is you're getting into areas that are private property, private land, places that you could not go if you're just a regular person or a tourist here. You wouldn't have accessibility to these spots, and some of these spots that they take you are just really beautiful, back up in the mountains. This particular one is on the west side and from getting way up high on the mountain, you've got beautiful views looking down on the Lahaina roadstead. Kaanapali, Lahaina, you're looking towards Lanai and Molokai, all the channels that you've got going there. it's very beautiful and as I say, this is a place that you just would not be able to get to otherwise. This particular trip also has a unique feature to it. They have waterslides that going to reservoirs that are up there. You can stop and go on these slides maybe a hundred feet high that kind of zoomed down this hillside and launch you right off into the water. That's kind of a fun way to end your day after spending some time out in the ATVs. ATVs are fun, people really like them!